Khmelnytskyi Oblast Ukrainian Music and Drama Theater (Хмельницький обласний український музично-драматичний театр ім. М. Старицького; Khmelnytskyi oblasnyi ukrainskyi muzychno-dramatychnyi teatr im. M. Starytskoho). 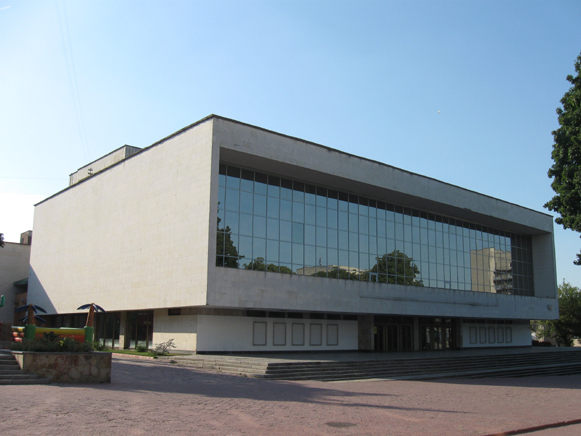 Founded in 1931 in Novocherkassk as the Northern Caucasia Regional Ukrainian Drama Theater, it was transferred to Ukraine and in 1933 became the Vinnytsia Touring Workers' and Collective Farmers' Theater. In 1938 it was renamed the Kamianets-Podilskyi Oblast Theater, and in 1954 it was transferred to Khmelnytskyi and assigned its current name. During the Second World War, the company toured the Far East and the northern fronts. For many years it operated under the tutelage of the Kyiv Ukrainian Drama Theater, which lent it stage directors and actors such as Hnat Yura, Kost Koshevsky, Amvrosii Buchma, and Yurii Shumsky. At first its repertoire consisted of Ukrainian classics, which in the 1940s were supplemented with Russian and Soviet plays and in the 1950s with the works of European dramatists including C. Goldoni, B. Brecht, F. García Lorca, and William Shakespeare.